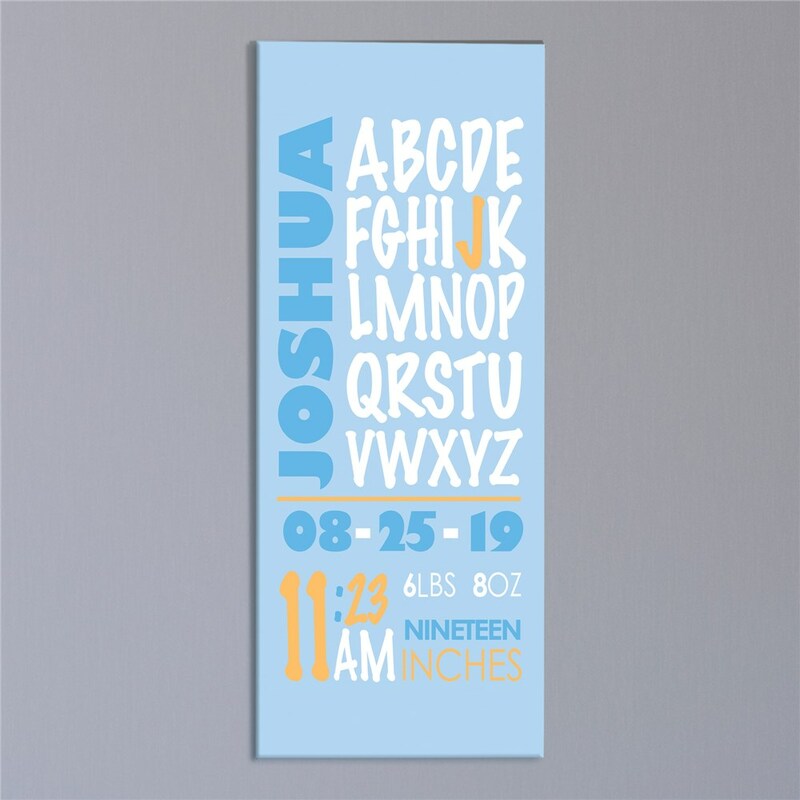 This personalized baby gift would make the perfect keepsake and nursery decoration for your new baby boy or girl! This is a decorative piece that your family can keep for years to come as a reminder of your new bundle of joy! 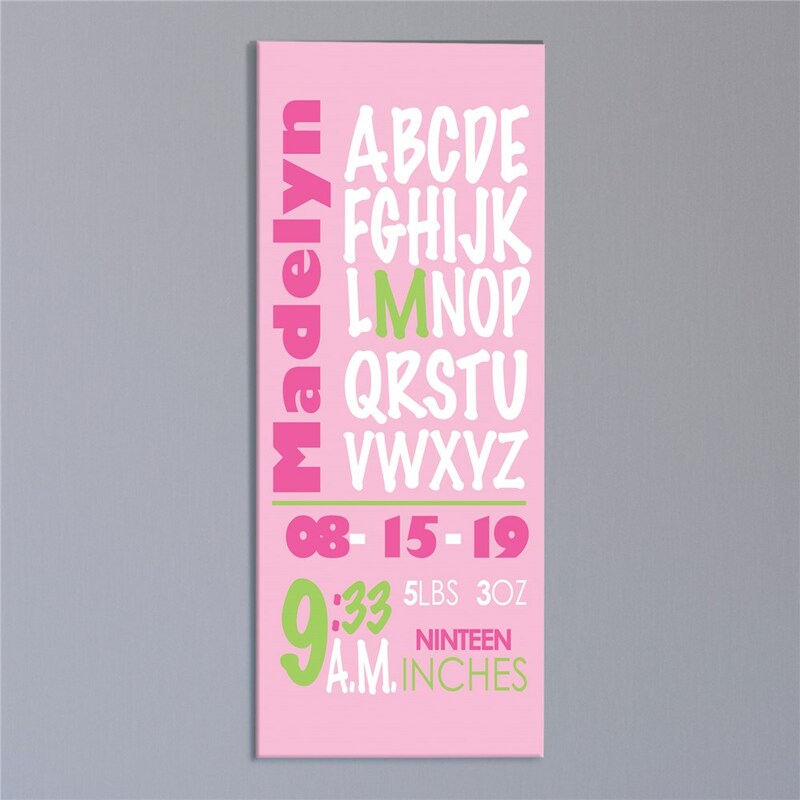 Great for Personalized Newborn Baby Gifts. Our ABC Baby Announcement Wall Canvas measures 14" h x 8" w and has gallery wrapped edges so they are perfect to hang with or without a frame. Add personalization at no charge to make this newborn baby canvas truly one of a kind. This came just as described and in a reasonable amount of time. The quality is good and no errors on the info I supplied. I loved this original gift that I ordered! I didn't find anything like this on anyone else's personalized gift sites. I ordered 2 of them because I have twin boy Grand baby's and these turned out so cute!!!!!! Additional Details New parents would love receiving this personalized gift at their baby shower for their child's nursery. This wall canvas can be cherished as a keepsake as a reminder of the day they welcomed their child into the world. Our Embroidered Baby Boy Cuddle Blanket would be a great gift choice as well.